Vembu BDR is a portfolio of software solutions designed to provide organizations with their disaster and recovery requirements. It helps businesses keep their data safe, regardless if they are stored in a virtual or physical environment. The tools that come with the system are designed to help users secure their data. This robust piece of software can be used by all business types and sizes and is likewise highly-recommended for service providers who want to offer services such as BaaS and DRaaS to their clients. Vembu BDR is quite flexible as it can be deployed both via cloud or on-premise. Large deployments are easily managed and monitored, thanks to the app’s centralized management and monitoring portal. The platform is user-friendly, it essentially does everything for you. It offers various recovery options as well as an in-house file system for systematic and organized storage management. Data transmission is also secure, ensuring no information leaks or unauthorized data access occur. The suite is made up of software products that are designed to provide backup and recovery for VMware vSphere, Microsoft Hyper-V, physical Windows servers desktops/laptops, file servers, MS Exchange, Active Directory, SQL Server, SharePoint, Outlook, and other similar applications. Vembu BDR Suite is a highly intuitive system, in effect changing the backup and disaster recovery landscape. Its simple yet powerful backup and recovery tools are designed to make BDR as simple as possible. Initial installation and configuration are made simple even for novice users, thanks to its very intuitive user interface and seamless installation process. Prerequisite systems MySQL, connector, and MongoDB are installed as part of the process, making the whole installation quick and easy. That said, you can customize the installation configuration based on your preferences and business requirements. Over the course of the backup job, you can easily monitor its progress via the app’s Progress Details screen. You can also drill down to the progress and get details of the backup process. Recovering files is equally simple and quick with Vembu BDR Suite. Designed to back up virtual machines running on Hyper-V and VMware, the platform’s Vembu VMBackup tool integrates with any virtual environment, providing you with easy restoration and a great backup experience. What’s great about the tool is its ability to provide recovery points along with its backups, which last for months or even years. Its user interface is intuitive, using simple configurations to handle critical use cases. The system is a cost-effective tool that drives data protection efficiency without sacrificing its enterprise-grade features. Vembu BDR Suite has a tool called Vembu ImageBackup, which helps protect users’ Windows machines. It does this by generating a disk image of physical Windows endpoints and servers. This feature allows administrators to restore Windows systems with the use of Bare Metal Recovery. The app can back up whole disks or specific Windows system partitions, along with operating systems, application, boot information, files and system settings. Cross-platform migrations are also supported, allowing for the migration of physical Windows workstations and servers to virtual environments. The software helps protect your critical files and apps with its VembuNetwork Backup tool. It basically hands to you total control over your data while protecting all pertinent information across application servers, workstations, and file servers. It also ensures that all critical files and applications are constantly kept secure. Keeping your data safe in your primary server is a good thing but getting double protection never hurts. The platform’s Vembu OffsiteDR does this for you by replicating all your data in offsite location data centers. This effectively results in lesser business downtimes and data availability during disasters when primary server data cannot be accessed. What Problems Will Vembu BDR Suite Solve? 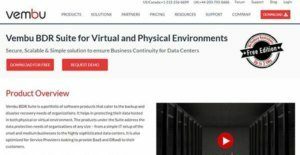 If your physical or virtual server containing critical data crashes during peak business hours, Vembu BDR suite can help you take charge of the situation using its Quick VM recovery and Instant File-Level recovery functionalities. With Quick VM recovery, you can instantly recover the backed up physical or virtual machine on any of hypervisors like VMware ESXi or Microsoft Hyper-V or instantly recover the crashed files alone using Instant File recovery. Business critical VMs can be replicated from one ESXi host to a DR host for disaster recovery purposes. During a disaster or a crash of the production host, the replicated VM can be powered on (failover) and your business operation can be continued on the replicated VM. After the main host is made ready or replaced, the replicated VM, along with the changes can be moved back (failback) to the new host. The failover and failback process can be made with minimal downtimes during a crash or disaster. Every business starts out small. As a business grows, its servers, workstations, and data also increase, making it imperative to scale its BDR systems. Vembu BDR suite is a highly scalable backup and disaster recovery software. Additional storage space can be added at any time as your need arises. And Since Vembu has built-in compression and deduplication mechanisms, the storage requirement for backup repositories is comparatively less. If you are interested in Vembu BDR Suite it may also be beneficial to check out other subcategories of Best Backup Software collected in our database of B2B software reviews. Every company has different wants and requires a system that can be personalized for their size, kind of workers and buyers, and the particular industry they are in. For these reasons, no software can offer perfect features out-of-the-box. When you try to find a software product, first be sure what you need it for. Read some Vembu BDR Suite reviews and ask yourself do you need basic features or do you require advanced features? Are there any industry-specific tools that you are searching for? Get the answers to these queries to assist your search. There are multiple elements that you need to reflect on and these include your finances, specific business wants, your organization size, integration needs etc. Take your time, check out a few free trials, and finally select the system that offers all that you need to boost your firm effectiveness and productivity. We realize that when you make a decision to buy Backup Software it’s important not only to see how experts evaluate it in their reviews, but also to find out if the real people and companies that buy it are actually satisfied with the product. That’s why we’ve created our behavior-based Customer Satisfaction Algorithm™ that gathers customer reviews, comments and Vembu BDR Suite reviews across a wide range of social media sites. The data is then presented in an easy to digest form showing how many people had positive and negative experience with Vembu BDR Suite. With that information at hand you should be equipped to make an informed buying decision that you won’t regret. What are Vembu BDR Suite pricing details? What integrations are available for Vembu BDR Suite?